Downtown Clinton, North Carolina boasts a vibrant area of shops, restaurants, and businesses that led the city's "All American City" designation. The city hosts a variety of events downtown including Rockin' Run for the Arts, Halloween on the Square, Christmas in Clinton and their summer concert series Alive After 5. Clinton also became Main America accredited in 2017. It's a city that is proud of their community and their roots. Visitors can enjoy the Sampson County History Museum, the Sampson Community Theatre and from May-October the Sampson's Farmer's Market & Tree Park is held at the Clinton City Market downtown every Wednesday, Friday, and Saturday. Sampson County's first public art project, "Milling Around" can also be seen downtown, a glass art installation that pays homage to the city's mill history. 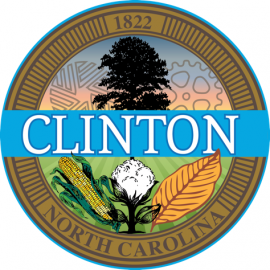 The millstone represents hard work, community, cooperation, and innovation, qualities that the people of Clinton and Sampson County hold dear.